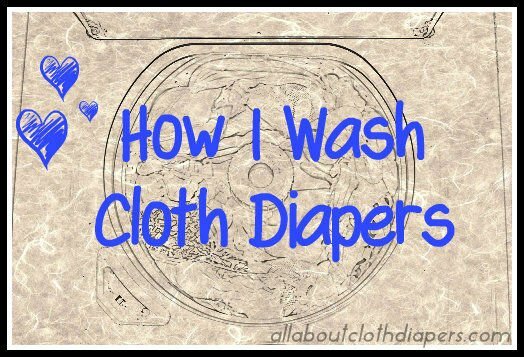 What works for me…How I wash cloth diapers! I am going to start by telling you while this wash routine works great for me, there is no guarantee that it will work for you. There are so many variables to consider with cloth diaper laundry (i.e. Water type, washer type, detergents, which cloth diapers are used). I actually really wish it weren’t so hard for some. There are many people who cloth diaper and have never had a single issue with their wash routine. Unfortunately, that is not the case with everyone. Washing newborn diapers was so much easier. I used Thirsties Super Wash and loved it (sadly this is no longer made). But when the wash only needs to clean exclusively breastfed or formula poo it’s a totally different ballgame than cleaning toddler cloth diapers. There is no reason for an extended cycle for a prewash. All that does is swirl poo particles around your cloth diapers for a longer period of time. Some people have success with cold prewashes…I didn’t though. I have heard that whatever you are trying to remove is easier to rinse at the temperature that it was put in at. In this case body temperature. Hence the warm instead of cold prewash. My water is set to 120 degrees for the hot water. Check with the manufacturer of each diaper you use just to make sure you are using the appropriate water temp for your cloth diapers. I use the Original Ultra Tide. I fill the included scoop to the 2 line. I also use Oxiclean. Included scoop to the 1 line. Finally, I recently started adding Calgon. Calgon is like a miracle for hard water. I use a full capful of Calgon in this cycle. I know that sounds like a lot. But as I said after MUCH trial and error, I discovered that without the Calgon, I was having to do far too many rinses to get everything clean. My wash cycle is set up to run a cold rinse anyway. I just let it run automatically after the hot wash cycle is done. In order for me to get a hot rinse I have to use the regular short wash cycle. I let the hot water fill up but I don’t add anything. Once the water fills I turn the dial to the final rinse cycle. If I don’t do this I usually forget about the diapers and the whole wash cycle runs again (with another rinse). I don’t want that to happen because this one extra hot rinse is enough. I hate to use more water than I need to because I already use a lot of water as it is. Every once in a while, when my inserts are starting to get a little crunchy, I throw a little Mrs. Meyer’s Lavender Fabric Softener in. It’s cloth diaper safe. I only use a small amount, maybe a quarter or a half of a capful. Check out my review of Mrs. Meyers Fabric Softener to see if it’s something that will work for you! That’s it. 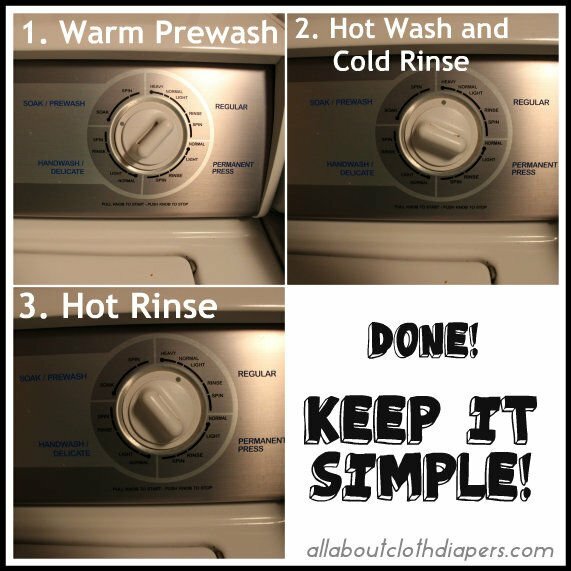 Warm Prewash, Hot Wash, Cold Rinse, Hot Rinse…done. Remember: Keep it simple! Wondering how Autumn washes her diapers? Check this out! 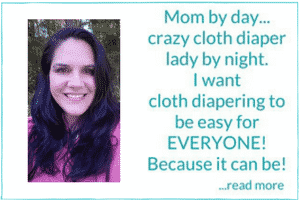 Have you got you cloth diaper laundry figured out? What is YOUR wash routine? Thanks for the routine. It’s interesting you posted your hot water temp. We don’t have a hot water heater and I wonder what our hot water is set at. All I know is that it is HOT. I hope it’s not too hot. We have been having terrible rashes for the past few months. My son is just over 2. We have a front loader and hard water. I have been playing with our wash routine and tried striping and it doesn’t seem to be getting better. We use vac out, soak on warm twice, wash on hot with country save, icicle an, and calgon, and 2 cold rinses with grapefruit seed extract and tea tee oil. We tried tide and it didn’t make a difference so back to country save. We try to wash about 12 diapers at a time and every other day. On sunny weekends I try to sun the diapers. I work full time so no daylight to work with during the week. I know it seems complicated, but we keep adding things to see what will happen. The rashes only seem to get a little betterif we switch to disposables and come back once we are back on cloth. We had a few rashes earlier, but nothing like now. Do you have any suggestions or does something stand out as the issue? Thanks for any advice. Hi Melissa, Sorry you have been having issues! Some little ones had sensitivities to certain soaps or even wetness. 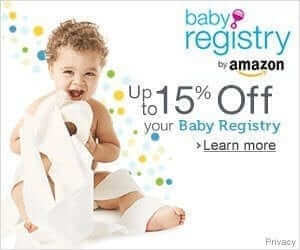 Can you tell me which cloth diapers you use, what the rash looks like and also do you use a rash cream? I have a variety of cloth diapers. AIOs (Moraki, Simplex, Bottom Bumpers), pockets (Rumparooz), and fitteds w/ wool (Sustainablebabayish and Woolly Bottoms) for overnight. The fitteds and wool are a newer addition, trying to use something more breathable at night. We used the pockets before we switched to wool a couple months ago. Day care is great about changing him every 2 hours unless he has a long nap. We were using CJs Butter spray before the rash and California Baby when there were slight rashes. We have a nystatin prescription for when we get the bumps that look like yeast and triple cream ointment for when the sores open. The rashes are mostly red bumps and sometimes open sores. This week he also got a rash outside of the diaper area where the fitted (not the seam, but the bulky area) touched his thigh over night. He is in disposables, but no improvement yet. He is also getting some new molars which is probably part of the problem. I also noticed a few auto correct issues in my first post – bac out not vac out, oxyclean not icicle an. So I’m new to this and know NOTHING about my washer’s options. So I can set the temp for the cycles and my typical cycle includes the wash cycle and then the rinse and spin. There is an option for “extra rinse” and the options are “Off/off, off/on, on/off, on/on” so does that mean it’s asking if I want to run an extra rinse after each of the two parts of a regular cycle (like extra after first and extra after second or only extra after either or not at all) or am I reading that wrong? I have a pre-wash option and an extra rinse setting that I turn the dial to after my regular wash cycle but I didn’t know if that knob for “extra rinse” meant I could set it and forget it. Hi Courtney, Simply: SHort rinse to get poo off, regular wash cycle (includes normal wash cycle and one rinse). Then add on extra rinse. I have a HE front loader that has been a challenge to wash with after more than a year struggle I have settled Into a warm rinse cycle high spin hot wash on the heavy soil and high spin then a bulky cycle with hot water and the highest spin speed which is medium and then another warm rinse. I always press the water plus button on any cycle. It may seem complicated but it’s just pressing buttons and since starting this routine 8 months ago I have had no issues at all! And have had no need to strip/deep clean. I use ecos detergent. I thought I read an earlier blog post by you that said you let yours soak for a few hours or overnight & then did the Hot Wash, Cold Rinse, followed by one or two more rinses till there were no more suds. I’ve been washing mine like this for sometime now. Also, I use a 1/2 vinegar in my soak/pre-wash to help get the odor of ammonia out. I use very little detergent (I use liquid) because it already seems to take those extra rinse cycles to get all the suds out. I may be wrong, but it seems like when I don’t get all the suds out we seem to have more trouble with leaks & odors. That was why I stumbled upon this blog in the first place, because I was having problems & was at my wits end. Hi Loucrecia, Vinegar works great in laundry in soft water. If it works for you that is awesome! Yes, not getting all the suds means that there is still detergent left. After a while detergent buildup can cause problems. For me the one extra rinse does it thank goodness! I’m about as simple and basic as they come. I do not spray or scrape my diapers. If there is something solid enough to plop in the toilet, I plop it, if not, into the wet bag or diaper pail it goes. Then every 2-3 days I take it out, dump it in the washing machine, and do a cold rinse (or sometimes a light wash if extra dirty) – hot wash/cold rinse – followed by a second cold rinse. Viola. Easy peasy. My diaper laundry really isn’t much different than my regular laundry, considering that it just gets taken off, thrown into a bag, and then dumped in my washer. The only difference is I have to restart the wash a couple of extra times with my diapers. I too use Tide, just to make things simple, since I can get it from any store I walk into. This routine has been working great for me for the past 2 years. When it comes to cloth I use the KISS approach. I never understood the whole fuss over spraying, and sunning, etc. etc. Too much hassle for me, and not really any difference in the results. I am new to cloth diapers. Did/do you a diaper sprayer? Our little ne is almost 2 months old. He is breastfeed, with an occasional supplement bottle. So I have a few different types and brands of diapers. I am currently using tide free and clear. At the moment we aren’t getting hot water to our washer so I start with a cold rinse, then normal cold wash/rinse with a full scoop of SUN powder detergent. I prefer Arm and Hammer detergent but they were all out last time I went to the store so I got the cheapest alternative. Can someone explain why an extra rinse is necessary at the end? Hi Laurie, For most people the one rinse that is included in the regular wash cycle isn’t enough to rinse out all of the detergent. If you can still see bubbles (stop the rinse cycle and as the water settles), the detergent isn’t rinsed all the way out yet. Without the extra rinse, the detergent builds up and over time can cause repelling. There are some people who don’t do an extra rinse and are fine. I say if it isn’t broken don’t fix it. If no extra rinse works for you great. I just happen to need it. Thanks for the great question! I do a cold rinse, then a hot wash with All Free and Clear, then cold rinse. Then everyone hops in the dryer except covers and wetbags! I was having some stink issues on a couple inserts and I realized I wasn’t using enough detergent. They always say to only use a little, but you need to make sure it is enough! I upped the amount a bit and everything is smelling free again :) I use Best Bottoms microfiber inserts with my 3 month old. I can’t cloth diaper past a year though due to ammonia issues! I could never figure it out with my older two. Hopefully it goes better this time around. I do a cold rinse, hot wash with Purex Natural Element Linen and Lily Scent(yum)a capful of Calgon and occasionally oxi clean powder, cold rinse, and then an extra cold rinse. I have BumWare all in one diapers so as recommended I dry them on medium heat. I have to do this twice to get them completely dry though. Once or twice a month I switch the detergent to Rockin’ Green’s Hard Rock detergent with Calgon to help strip away any build up the conventional detergent or hard water have left behind. When I first began cloth diapering I only used cloth diaper soaps such as Charlies, but for me, had nothing but problems. Rockin’ Green Hard Rock has been the exception. This is my actual go-to detergent when I do begin to have stink issues. Once I switched to purex natural elements all my stink issues went away and cloth diapering became easier and less stressful. When I switched to BumWareBWX All in One’s they actually discouraged use of Charlie’s due to issues such as these. I also have an old top loader, I do a presoak with about 2tsp of Washing soda (about 30mins warm). Then warm pre-rinse, then Cold full wash with home-made detergent. I hang up any covers, wet bags, or inserts w/ outer PUL. and machine dry everything else. I have an 18 month old and a 4year old in training underwear. That still seems a bit complex to me…. My little man is still little though. I use tide ultra as well, and I just put my he top loader on heavy duty with ALL of the extra option buttons–presoak, second rinse, and something called stain treat…. It’s on the warm/warm setting. It works for us!